Love the blue - got the blue! The bowls come in a good range of sizes. The smallest bowl is not that small. I'm using them now, and I know I'll continue to use them for a wide range of purposes in the future. I bought these for a gift, but when I saw them I just HAD to keep them! They're very pretty and thick. 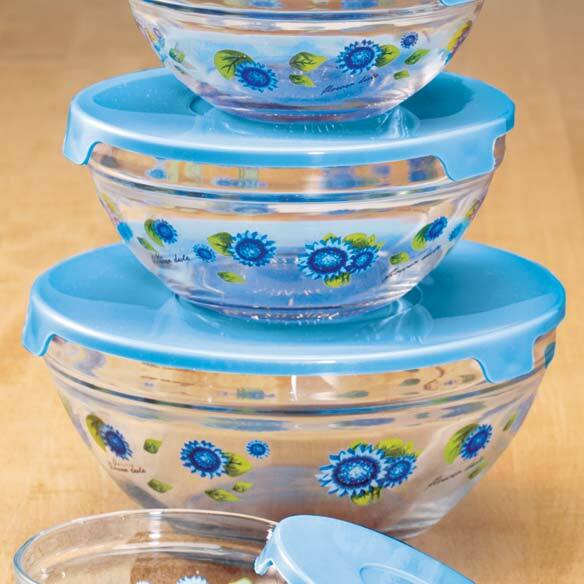 Love these bowls and make great use of the varied sizes. I use the smallest for dips and sauces. Just be aware that while they seal well enough for food storage, they will leak if tipped. Beautiful bowls. Match my kitchen décor. Reheat or storage. Will leak if overturned. Wish they came in larger sizes! Love my pretty glass bowls with lids. Love these containers ! Very pretty to look at and perfect for my leftovers ! These bowls are very pretty in addition to being useful. I have just ordered some more. I use them mainly for storage of small bits of left-overs. Those smaller than usual bowls are just perfect for saving food that would usually get thrown away, or put into an opaque container that would get shoved to the back of the refrigerator and forgotten until discovery day (garbage pick up day) when I go through and try to eliminate foods gone bad. These are a great set of bowls. I like a glass container to put my food in.The cleaning is also easier.I also like the decoration of the red apples to make serving in these a little more cheerful then just plain bowls.Plain words.....I really like them. I was very pleased with my purchase. Would buy again. Product looked exactly as shown in catalogue. I prefer using glass more so than plastic in microwave so I am quite pleased with this purchase. 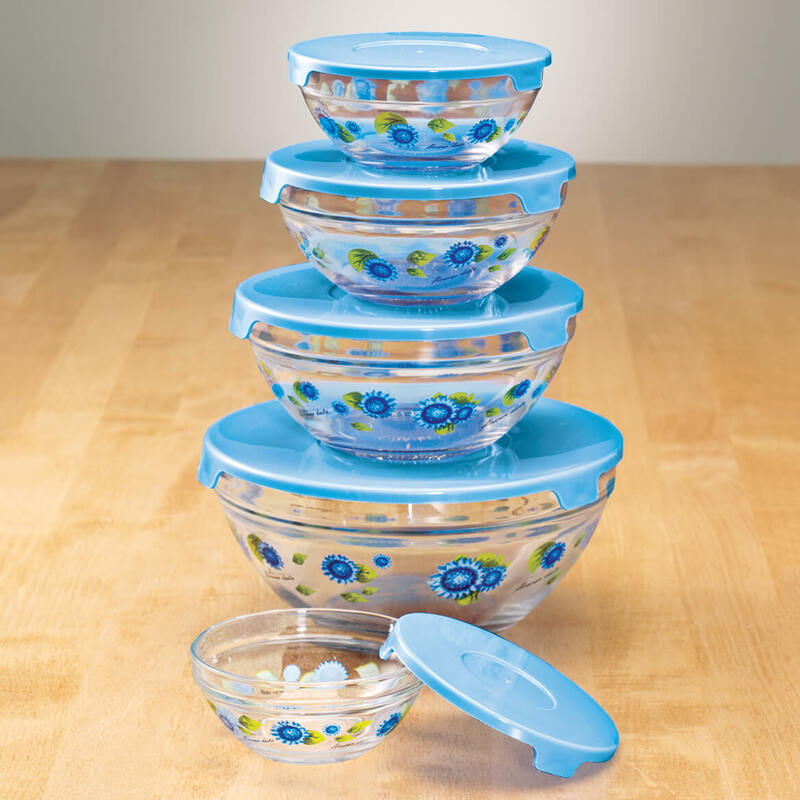 Perfectly sized for most anything that may be served or stored, convenient, and makes a great gift, I ordered to sets for gifts and was greatly appreciated, I would order the set again and would recommend to others. They're great for the price. But I'm not sure what one would do with the 5-oz and 8-oz bowls. You could keep one meatball in the 8-oz and 3 or 4 grapes in the 5 oz. Worth the price for the three largest ones but the two smallest are a mystery. Just too small for any practical use. 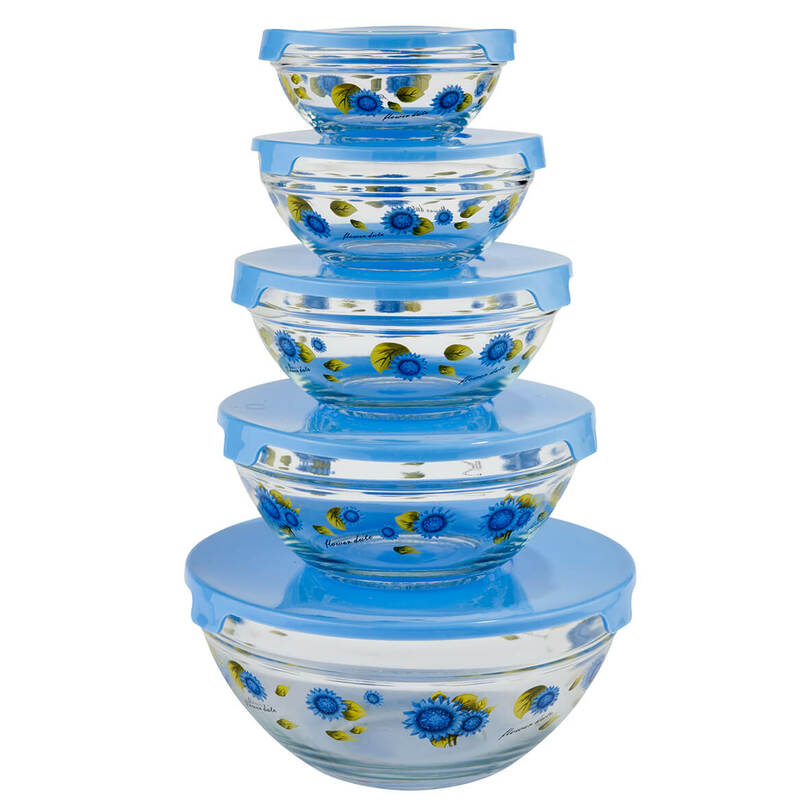 I bought this bowl set because of the color, pattern, size range and the fact it is glass. I feel it is better to re-heat food in glass containers. It is just what I wanted and has performed well. I really like the bowls. I use them all the time. Just have to handle them carefully when washing them, as the glass is not very thick . Verry pretty and I am satisfied. Giving it to my daughter-in-law to use as serving and storing foods. Set only good for leftovers;smaller portions.Not worth the price. But the bowls are heavy in quality and pretty. The bowls were smaller than I expected but are great for just a tiny amount of something left over from dinner. I like one pair of the tools, but three is more than I needed...I would've preferred to pay a lesser amount for one. When I opened the box, the middle bowl was broke in half and glass pieces in the box. And the smallest bowl is so little what would you even use it for. I sent it back today, cost me $8.90. Should of just kept it. Very convenient to place the rest of the food. They don't stain like plastic bowls. I am trying to eliminate my plastic containers. They will make nice Christmas gifts for my family. Blue is my favorite color. Others will know the food in these bowls contain items the not for dietary restrictions. 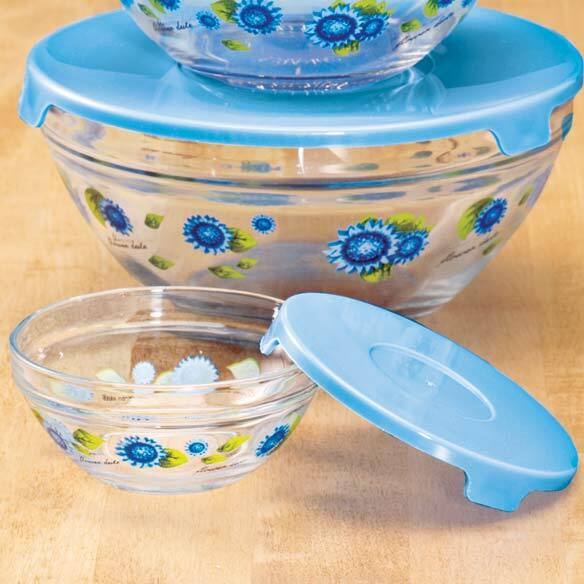 These colorful glass bowls offer the variety of sizes needed for multiple needs also the glass is more durable than plastic and easier to clean. Each has it own lid for storage, great to store leftovers without plastic. My wife liked the item in the catologe, so I purchased them for her. instead of using plastic containers, I like to save leftovers in a bowl. The items are glass and have tight fitting lockable lids. Two sets are gifts, one is for me. I like glass better than plastic and the design is attractive. need bowls, these have lids! I have liked it for a long time, but I had to throw out stuff to make room for them. I have had many problems with plastic Microwave products being stained and unable to clean. I seen this in your catalogue and it sounded sensible so I am going to try it. The other items were selected as I enjoyed going through your catalogue. I have ordered from Walter Drake previously and was well satisfied with your products. I bought two sets for myself two years ago and decided to buy them for a friend. We have another set in a different color and our happy with it. I need different size bowls. They go with my dishes. BEST ANSWER: Thank you for your question. The Floral Glass Bowl are manufactured in China. We hope this information will be of help to you. 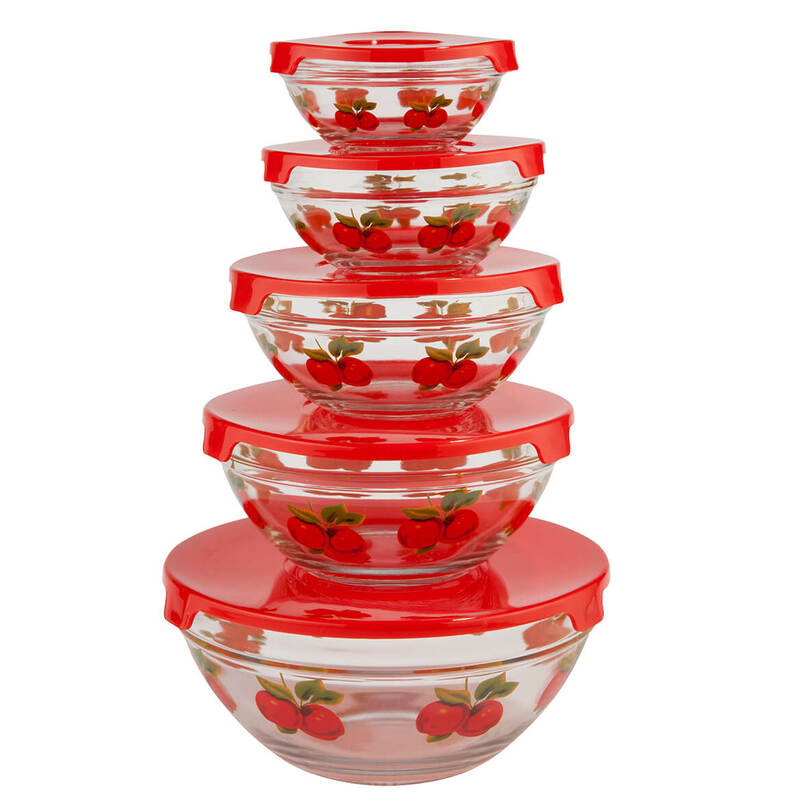 Do bowls nest together, with lids , for storage?